Kermit shows off his mask at the LAPS Mardi Paws Barkus Parade in Frisco. His owner is Amy Walls. 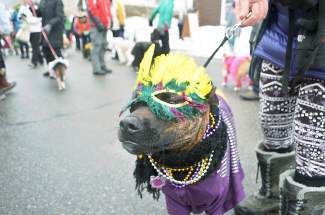 Local dogs and owners came out in force despite falling snow for the very first Mardi Paws Barkus Parade, put on by the League for Animals and People of the Summit (LAPS), the town of Frisco and the Lost Cajun restaurant. Colorful masks, sparkly capes and feather boas graced both canine and human participants for the Frisco Main Street parade on Saturday.